A combat tomahawk, or tactical tomahawk, can be very useful depending on the knowledge and skills of the person holding the handle. This product can be considered both a tool and a weapon and should be added to your collection of outdoor gear (hiking, hunting, camping, etc.). Since you don’t want to load yourself down with too much weight or bulk, so finding equipment that can ‘multitask’ is highly advantageous. One of the great things about the typical combat tomahawk is its light overall weight. They are not heavy like traditional axes, thanks to the design and materials. 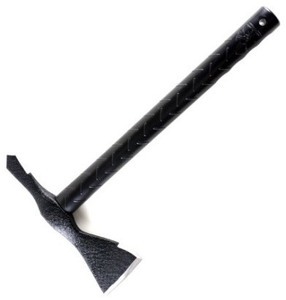 If you are thinking about a large, heavy object when you picture a tactical tomahawk, you probably haven’t seen the products that have made their way onto the market in recent years. Today’s tomahawks are technically advanced, ergonomically designed, easy to carry, and can manage a number of different tasks successfully. After reviewing all the top Tactical Tomahawks available, we’ve selected our top 7 picks in the comparison table below. We’re confident you’ll find the perfect model for your needs. In this article, we have provided you with a list of buying considerations to think about while shopping for a tomahawk. Once you have learned a little about the process of picking out the right combat tomahawk for your needs, the article will shift into listing five of the best options on the market today. All of the tomahawks listed could make for a great choice depending on your specific needs. 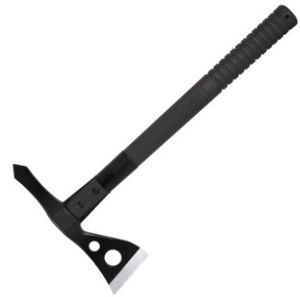 If you are new to the tactical tomahawk market, it is easy to get overwhelmed by the number of options that you will find. There are truly an incredible number of quality tomahawks available today, and each has a unique design and set of features which sets it apart from the crowd. If you don’t know exactly what you are looking for right from the start, you might find yourself wandering from website to website for days before you finally make a decision. To get started, think about how long and how far you are going to be carrying your tomahawk. Is it mostly going to stay in one place, or are you going to be traveling long distances with it? If it is going to be traveling with you on long hikes or other outdoor adventures, you will want to find a lightweight model that is easy to carry. 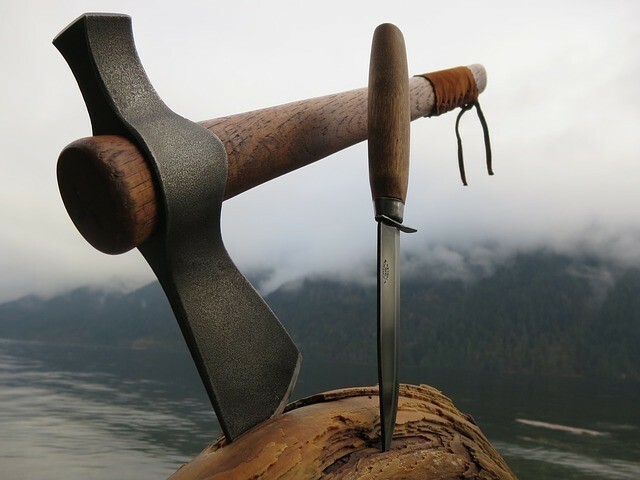 A heavy tomahawk is going to quickly weigh you down while on the move, and you will be tempted to just leave it behind if the weight becomes too much. Of course, there is a direct relationship between its weight and the type of materials used to make the item. Some tomahawks are made from heavy steel, which is obviously strong and durable but is also going to add weight to your load. A heavy steel tomahawk will be an excellent choice for some users, but others will find them to be too hefty and hard to wield with precision. Some prefer to go a different route and look for a steel blend that is lighter in weight and meant for regular use without inducing fatigue. What do you want to do with the tomahawk? That is really the main question that needs to be answered before you make your purchase. The answer to the initial question will dictate the design of your tomahawk, as the head and even the handle of tactical tomahawks come in a wide range of styles. Some feature heads that closely resemble axes, with a traditional shape that is tapered from one end to the other. However, some modern tomahawks have rather exotic designs within the head shape, allowing the tool to be used for a number of different jobs. Some of the Tomahawks that are on the market today are designed for demolition, as they are angled and shaped in a way that makes it easy to pull apart wood structures or even to go through a door. On the other hand, some models are designed for self-defense, and those items are lighter in weight, easy to maneuver, and offer a great grip. Chopping wood, digging holes, and prying are other uses for combat tomahawks. With every life’s purchase, there is some budget, and the same goes for combat tomahawks. The good news is that you can easily find a quality tomahawk for a very reasonable price. Of course, as with any market niche, there are also models that rise well above that price, which include a long list of features and use premium materials. It is going to be up to you to decide how much you would like to invest in one of these. If money is a huge concern, you can always make one yourself. Most of the issues that arise for tomahawk owners who are unhappy with their purchase come down to the quality of the product that they received. It is essential to pick a model that comes from a quality manufacturer which has a reputation for great gear. You don’t need to buy the most expensive tomahawk on the market to get a good product, but buying one solely because it is the cheapest probably isn’t a good strategy either. Place emphasis on quality when you pick out your next combat tomahawk, and you will definitely be satisfied. Also, you want to make sure the model you purchase is the right size for your needs. Tomahawks come in a range of sizes and weights, each with its pros and cons. As mentioned above, a heavy tomahawk isn’t going to be an excellent choice for long journeys, but a lightweight option isn’t going to work well for breaking through a door. To avoid the frustration of getting the wrong size, pay close attention to the listed dimensions on any hatchet that you purchase. The main benefit of owning one of these tactical tomahawks is its versatility. If you regularly work with your hands under unpredictable circumstances, having a combat tomahawk handy can be helpful. With the ability to pull things apart, even break through sturdy structures, and pry with ease, there is a lot to like about a Tomahawk. Also, if necessary, they can provide you with a great sense of security from a self-defense standpoint. Another benefit is the ability of a combat tomahawk to cut down on the number of pieces of equipment that you need to carry. 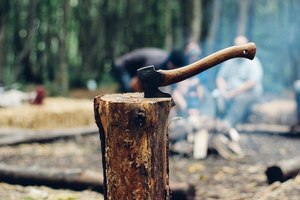 For example, if you would typically carry both an ax and a crowbar, one quality tomahawk can do the job of both; saving you weight, space, and money while you are assembling your personal kit that will get you through the toughest jobs and excursions. 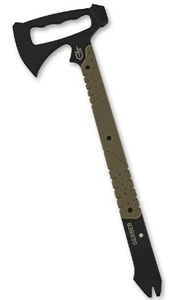 To start our list, we have a solid all-around tomahawk with a basic design and classic appearance. This tomahawk comes in at 19’’ in length, with a hawk length of 8.75’’. It has a polypropylene handle, and the steel is drop forged 1055 carbon. The cutting edge on this product is 3.5’’, and the back of the hawk has a wedge-shaped spike which you can use for a variety of purposes. Also, to the classic design, another feature that buyers will appreciate is its price point. Despite its lower price point, customer reviews and ratings rave about its high quality. Buyers like the sturdy handle, the included sheath, and the functionality for hunting that comes through with this design. This product looks rugged, and users report that it lives up to that appearance out in the field. For an all-around hawk that will likely hold up to anything you ask it to do, the old Steel Trench Hawk Axe is a product worth your consideration. This American LaGana Vietnam Tactical Tomahawk is a step-up in price. But you get a great product that is worth every dollar. It is made from drop-forged 1060 steel, with a super-tough modified nylon handle. The handle is oval-shaped which makes it easier for you to hold on tight, and it includes a nylon sheath. According to the manufacturer, this product can be used for everything from building shelters and cutting firewood to self-defense, aircraft extraction, and more. The sturdy build of this product is praised by reviewers, as it seems to be able to take a beating with no noticeable damage. Also, it is well balanced for throwing according to many users, so that is something to consider if you plan on throwing this tomahawk. While it can be expensive in comparison to some of the other popular brands and models on the market, many feel that the additional investment is worth it for the quality you get. The SOG tomahawk is one of the most-popular on the market, which shouldn’t be a surprise considering the combination of quality and price that it offers. You can own a quality hawk that is comparable to any of the more expensive options at an affordable price. The SOG uses a ballistic polymer handle with a nylon carry sheath, and it is a total of 15.75’’ long. The weight of 24 ounces gives this hawk good feel without overwhelming the user. Whether you are trying to breach a building or remove an obstacle from your path, the SOG tomahawk should be up to the challenge without much of a problem. Customer reviews claim it is well-made, durable, and has a solid feel in hand. They also praise it for being sharp enough for most uses, as well as its ability to handle the task of preparing firewood with relative ease. For the price, and considering the impressive quality, it is hard to imagine there is a much better deal in the Tomahawk world than the SOG. This is another moderately priced hawk. Reviewers love the quality of the stainless steel construction of this item, and they also appreciate the inclusion of a compass as part of the package. The sheath is praised in some reviews, as is the performance of this hawk in the air when used as a thrower. Falling in line with many other tomahawks that you will find available today, this one is 15.5’’ long, with a blade length of 8’’. The handle is nylon reinforced with 30% fiberglass, and United Cutlery chose to use 2CR13 stainless steel. 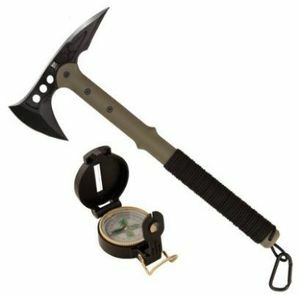 As mentioned above, this Tomahawk comes with a compass, which may or may not be a bonus to you depending on your need for a compass (and also depending on whether or not you already own one). There are many great tomahawks on the market today, and this is yet another – give the United Cutlery UC2836 M48 Ranger Hawk Axe a close look before buying your next hawk. The last item on our list is also the most expensive, so this will take some serious commitment if you are going to add this item to your collection of tools. But in return, you get a product that is made in the USA and has a 420HC steel body. The sheath is MOLLE compatible, and the design of this hawk integrates both a hammerhead and pry bar. This tomahawk is bigger than the others we have covered, as it is a total of 22’’ long. Reviewers enjoy the pry bar feature on this hawk, claiming it is comparable to any individual pry bar that you would carry with you. The built-in pry bar means that is one less tool you have to haul around. The one complaint that is common among the reviews is that the blade comes rather dull. However, that is a problem that you can solve with some basic sharpening equipment, or you may decide that the blade is already sharp enough for your needs. It is true that you will have to make a serious investment to own a Gerber Downrange Tomahawk, but you will get an impressive tool in exchange for your money. Overall, choose a Tomahawk that fits your needs. Do you want a throwing hawk, or will you be using it while you camp and chop wood for a fire? Establishing your needs for your hawk is the first step in the process. The good news is there are plenty of great combat tomahawks on the market today, and many of them are available for somewhat reasonable prices. Hopefully, you found the reviews and ratings helpful in making an informed purchase on your Combat Tomahawk.